What is the Watsonville Area Water Recycling Project? The Pajaro Valley Water Management Agency (PV Water) partnered with the City of Watsonville to introduce the Watsonville Area Water Recycling Project as part of PV Water’s long-term plan to meet the water needs of our region. This recycling project will provide nearly a quarter of the water needed to halt seawater intrusion on coastal lands and is a cost-effective way to maximize local resources before turning to other supplemental sources. The recycling project exemplifies municipal and agricultural cooperation to protect water resources. The recycling project is located in Watsonville, California. Why do we need it? What are the benefits? The Watsonville Area Water Recycling Project is vital to our region. California’s warming mediterranean climate requires us to use every tool at our disposal to effectively manage our water resources. Providing a constant and reliable supply of recycled water that is available year after year, regardless of weather conditions, will help protect the $1 billion agricultural industry and thousands of agricultural jobs in the Pajaro Valley. When did the project start? Water deliveries began in April 2009. The Watsonville Area Water Recycling Project uses well-established processes that are employed throughout the United States and globally. California has strict standards for regulating recycled water use and the Watsonville plant meets all State and Federal requirements for recycled water quality and safety. Where is the water from? How much water? Water used in homes and businesses travels through pipes to the recycled water facility where it is cleaned through physical, chemical and biological processes. The recycled water facility will produce 4,000 acre-feet of recycled water (new to the basin) to be blended with approximately 2,000 acre-feet of “blend” water, for a total of 6,000 acre-feet per year. This water, delivered through our coastal distribution system, will be able to irrigate a portion of more than 6,000 acres all year long. It is considered “new” water since it otherwise would be discharged into the Monterey Bay National Marine Sanctuary. The nearby Castroville water recycling project safely delivers more than 13,000 acre-feet to farmlands each year. If I need more information, who should I contact? Why is the project needed? The Watsonville plant is a key part of the PV Water’s long-term plan to meet the water needs of our region. Recycled water is a constant and reliable supply that is available year after year regardless of weather conditions. In addition, California’s ongoing drought requires us to use every tool at our disposal to effectively manage our water resources. Recycling is a cost-effective way to maximize local resources before turning to other supplemental sources. How does recycling water slow seawater intrusion? Without recycling water, the fresh groundwater supply will diminish more quickly, speeding intrusion of seawater and ultimately devastating our agricultural economy. About 10,000 AFY of pumping needs to be replaced near the coast to halt seawater intrusion. The Watsonville plant will provide a signifigant portion of the water needed to halt seawater intrusion on coastal lands. Besides slowing seawater intrusion, what are other benefits of water recycling? Water recycling protects the environment because almost all of the byproducts can be used for irrigation and electricity generation, and any residual solids can be converted to biosolids for use as soil amendments. In addition, recycled water is used for crops, these plants can benefit from the nutrients in the recycled water, so fewer commercial fertilizers may be used. Is recycled water safe for use on crops? Yes, recycled water is perfectly safe for use on agricultural crops and for a wide variety of other domestic uses. The recycling process is safe, well-established, and highly regulated, and the water meets all State and Federal requirements for recycled water quality and safety, including the more stringent standards here in California. Recycled water is a common source of supply for growers across California and other Western states. The nearby Castroville project has safely delivered more than 13,000 acre-feet of recycled water to farmlands each year for more than twenty years without one single permit exceedance. How is wastewater converted into safe water? Wastewater is conveyed from homes and businesses to pump stations in the area. The wastewater is then pumped to the Watsonville Wastewater Treatment Facility where it receives treatment from Primary, Secondary and Tertiary processes. Primary treatment consists of trash removal, preaeration, and gravity separation. While secondary treatment uses microscopic organisms found naturally in the environment to remove and decompose of contaminants. Tertiary, or recycled water treatment, moves secondary treated wastewater through the water recycling facilities where coagulation, flocculation and sedimentation occurs after Alum (Aluminum Sulfate) and polymers are added, next cloth media filtration occurs and finally disinfection with 600 Ultra Violet light bulbs. After treatment, the recycled water is held temporarily in three tanks that total 2.5 million gallon of storage before being distributed to farmland via a 21 mile underground pipeline system called the Coast Distribution System. What kind of testing is done on the treated water? How are the byproducts of wastewater recycled? There are three byproducts of wastewater recycling: recycled water, biosolids and methane gas. Recycled water is used for irrigation; biosolids can be used as soil amendments, reused at the neighboring landfill as cover material or are turned into compost by mixing it with green waste, such as lawn clippings; and methane gas can be generated by anaerobicically digesting the solids removed during the primary, secondary and tertiary processes. Methane gas is used to fuel the City of Watsonville's wastewater plant cogeneration engine which produces 90 percent of the power used for primary and secondary treatment. How much water do you discharge into Monterey Bay? Currently, 7,130 AF of treated wastewater is discharged to the ocean each year. How much water do you treat? Up to 7.7 million gallons per day can be recycled. Where does the recycled water go? Recycled water is distributed to local farmland near the coast through the Coastal Distribution System. During the rainy season when the growers do not need as much treated water, it is safely discharged one and half miles off shore into the Monterey Bay as highly-treated secondary effluent, which the City of Watsonville monitors closely. What is the quality of the recycled water? 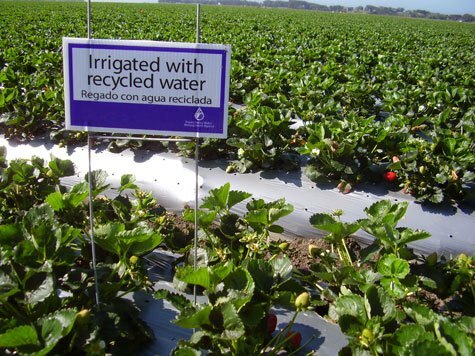 Recycled water is highly disinfected (99.999%) and similar in appearance to potable water, but has the added benefit of nutrients that are useful to plants, making it possible for farmers to use less commercial fertilizers. What crops use recycled water? Artichokes, broccoli, cauliflower, head and leaf lettuce, strawberries, celery, fennel, Brussels sprouts, radicchio, rapini and cardoni are some of the many crops that have been grown with recycled water. How much does the water cost the growers? Growers are assessed fees based on the amount of water used and acreage. Using recycled water is less expensive than using well water for irrigation when accounting for electircal and upkeep costs. How much total water do the growers use? Individual growers require different amounts of water, depending on their land size, soil type, location, crops, rainfall and other climate conditions. Growers typically require around two acre-feet of water for each acre of crop each year. Has the recycled water you’re delivering ever been contaminated? Our recycled water has not been contaminated. Our rigorous monitoring program and testing of the water allows us to ensure that we deliver clean, safe water for irrigation. When was the last time you couldn’t deliver the water needed? All growers have gotten all the water they need every day. Occasionally, growers are asked to take water at a different time of day. Where else in the country/world is recycled water used on crops? Recycled water is used throughout the world. In the United States most facilities are in California, Florida, Arizona, Nevada and Texas. PV Water efficiently and economically manages existing supplemental water supplies for growers in the Pajaro Valley Basin. It manages the entire groundwater basin which overlaps four major jurisdictions: the City of Watsonville, and Santa Cruz, Monterey and San Benito counties. When did the PVWMA start making deliveries from the Watsonville Recycling Plant? How much did it cost to build the project? Total construction was $48 million. Water recycling facilities construction cost $24.5 million, plus distribution system. Where did the construction funds come from? The construction was funded by the City of Watsonville, federal and state loans, grants and bonds. What training do employees receive? All plant and distribution operators receive initial and ongoing training on the operation and maintenance of the water recycling system. Required personnel also maintain the proper levels of state certification. Are there other California water recycling projects? Yes. In addition to the 250 water recycling systems currently operating in California, dozens of new projects are in the works. Current operating projects include East Bay Municipal District, South Bay Water Recycling Program, Padre Dam Water Recycling Facility, Santa Rosa Subregional Reclamation System, Irvine’s Commercial Reuse Project and San Diego Regional Water Reclamation System. Thank you! Please check your email to confirm your newsletter subscription. Subscribe and receive our quarterly newsletter.